When you see a steel structure pop up like a takeout box, don’t be fooled, as constructing superior metal buildings is no easy feat! From the ground to the skyscrapers, the element of steel has a long journey before it can live up to the high standards of quality expected at our steel structures & buildings company in California. In this post, we’ll outline each step of how steel is made and it’s life cycle before it reaches our client’s construction projects. 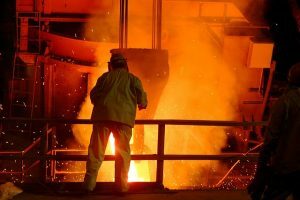 How Is Steel Made From Iron Ore? Good question! Steel is a metallic alloy that is predominantly made of iron but may include several other elemental components. In essence, steel is iron which has had most of its impurities removed, and since they tend to weaken steel, it becomes much stronger after elimination of the impurities. Carbon and several other elements, in conjunction with iron, provide the hardness that makes steel useful in many applications, for instance; the construction industry and for the manufacture of high-quality tools. Other elements are often added to intentionally modify the characteristics exhibited by steel, and these kinds of alloy steel include chromium, molybdenum, nickel, titanium, and others. All of these “elemental seasonings” are added to “molten steel soup” to produce diverse qualities and usages of each steel type. What is the Life Cycle of Steel? Steel starts out in the ground as iron ore, and in its most useful state, ends up as one of the steel garage buildings in your neighborhood, or in the superstructure of your local grocery market. So what happens in between iron ore and construction? First, rocks and minerals in the ground which contain iron ore must be extracted in an economical fashion. The actual iron in rocks generally occurs in the form of either hematite, limonite, siderite, magnetite, or goethite. The iron ore will be used to make pig iron, which constitutes one of the main materials used in the manufacture of steel. After extraction from a mining site, the iron ore is shipped to an iron-making plant. The next step is smelting, a two-step process to create a base metal from the raw iron ore by removing all unwanted materials. This first step of smelting is to remove the largest impurities from the raw steel. The iron ore is super-heated to burn out unwanted elements such as sulfur, which results in an oxide to be funneled into the second phase of the process, known as ‘reduction’. The oxide is subjected to extremely high temperatures in a furnace, so as to remove the oxygen element and produce metallic iron. 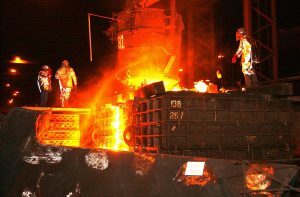 The molten steel is then poured into large molds and cooled until it forms semi-finished slabs, which are then used in the manufacture of finished steel products. Lastly, various chemicals are added to the molten iron to further reduce unwanted elements such as sulfur and phosphorous. Some chemicals are also added to produce specific kinds of steel, such as stainless steel, which is highly resistant to rust and is therefore highly desired for the making of tools and appliances. As one of the most recyclable materials on earth, most steel in use today has been processed at least once. The reason steel can be used in this way is that it loses none of its appealing properties during the recycling process – it remains strong, durable, and just as useful after recycling. It is highly advantageous to do this because it’s much cheaper to recycle old steel than it is to produce brand new steel from iron ore, and iron ore is not a renewable resource that can be used endlessly to produce new steel. We are proud to have developed such great working relationship with reputable and sustainable suppliers such as Nucor Steel. Nucor’s steel mills are among the most modern and efficient in the United States. Recycled steel scrap and other metallics are melted in electric arc furnaces and poured into continuous casting systems. Highly sophisticated rolling mills convert the billets, blooms, and slabs into rebar, angles, rounds, channels, beams and other products. Nucor has become an innovative leader in the industry, constructing the world’s first “micro-mill,” which transforms molten metal directly into steel sheet in just one remarkable step. The company also installed the industry’s first vacuum degasser for thin-slab casting, which allows for the production of grades of steel beyond anyone’s expectations. Only the finest metal building components are used to create our superior steel buildings, and that’s why clients have come to rely on Pascal Steel for all their steel structure needs. Our suppliers use innovative techniques to create steel in the most effective way possible, and we use recycled materials and innovative practices that reduce the impact on the environment, as well as reducing the time necessary for preparing materials used in steel construction. 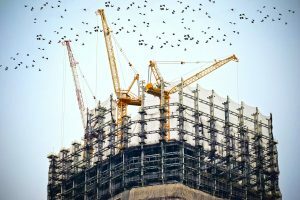 One of the most popular uses of steel today is in the construction of long-lasting commercial buildings. Pascal Steel is a premier manufacturer of metal buildings and steel structures in California. We have provided buildings to consumers, commercial companies, and government projects for six decades. View our project gallery for more examples of Pascal Steel’s craftsmanship with sustainable steel. Contact us with questions about how our building are constructed or would like to bring your structure to life.